Engineered to solve most common feed problems, FLSmidth’s V-Series feeder/airlock handles dry, fine powder or granular product in dilute phase vacuum or pressure conveying systems and in dense phase convey systems. A robust line charger, the V-series feeder is designed for up to 400°F and 29 psig (2 Bar) to feed pneumatic conveying systems more efficiently and at high-pressure differentials. 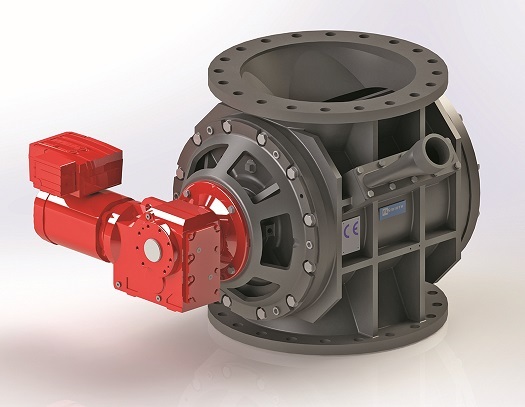 The 10-vane open- or closed-end rotor design minimizes slip leakage, while efficiently feeding through large inlet/outlet flanged openings. The inlet flange has an inverted integrally cast plow for deflecting granular material. Pressurized air from the pockets vents through a precisely engineered vent connection, which ensures no communication to the product inlet flange. The V-Series feeder is both NFPA and ATEX rated and is available in six sizes from 200 to 600mm. Options include an abrasion-resistant design and various voltages.